And the plot thickens! After two days we have some nice storylines going in Konya, Turkey. In case you only want to read one paragraph, here they are in list form: Wow, Dragan Bender; what’s going on with Georgios Papagiannis; do we seriously need to question Turkey; underdogs rule the day; Spain win but leave more questions; and man the 2014 FIBA U17 World Championship is going to be fun. So, let’s start with the fact that I still haven’t seen Latvia, Poland, England and admittedly lack a real idea about Czechs and Russia. Hopefully we can change that a bit on Day Three. Just look at the numbers – 34 points on 13 of 19 shots, 14 rebounds (8 offensive), two assists, two steals, two blocks and zero turnovers in 29 minutes in Croatia’s blowout win over Lithuania. That’s one heck of a game. And Dragan Bender is one heck of a player. He’s also the second youngest player at the U18 European Championship as he doesn’t turn 17 (!!!) until November 17, 2014 – one week before Greece’s Vasileios Mouratos celebrates his 17th birthday. There are plenty of reasons that Maccabi Electra Tel Aviv locked up Bender to a long-term deal – and we saw lots of those against Lithuania – especially scoring 15 points in Croatia’s 31-3 run spanning the third and fourth quarters. Bender has good size, length and quickness, has three-point range (4-of-8 through two games), rebounds well, passes well and takes care of the ball – just one turnover in 49 minutes. Let’s just say I cannot wait to see how he plays the rest of the tournament. Sticking with that Croatia vs Lithuania game, here just a note. In the 43 or so minutes of Lithuania I have seen (including the end of the France game) superstar Domantas Sabonis has scored two points as he made just 1-of-8 shots against Croatia and did not attempt one free throw. I’m not saying anything, I’m just saying. Speaking of not saying anything, that’s what Greece coach Ilias Papatheodorou is saying about why his superstar 17-year-old center Georgios Papagiannis is playing only a very limited role. As noted in the Day One roundup, the coach told a Greek journalist that Papagiannis playing only 5:08 minutes in Greece’s win over the Czech Republic was due to tactical reasons. This is NOT at all what is actually happening but this reeks of a dispute between Papatheodorou and Papagiannis – and it’s not over who has a cooler “Papa” last name. I talked to Papagiannis after the Czech game and asked how he’s feeling: “Fine, pretty good.” I didn’t want to ask him about the playing time because I really just wanted to introduce myself since I will be covering him at the 2014 FIBA U17 World Championship. Instead we chatted about his time in the States and him coming back to Greece for this up-coming season while still retaining his college eligibility. Papagiannis has actually been very productive in his time on the court. In less than 11 total minutes, the 7-footer has missed his only shot, collected four rebounds, three assists, one steal, two blocks while turning the ball over twice and committing three fouls. Greece were able to overcome Bosnia and Herzegovina and Czech Republic in the first two games without the big man in the middle, but can the Greeks handle Turkey on Day Three without Papagiannis? Speaking of Turkey, the tournament hosts suffered one of three upsets on Day Two as Bosnia and Herzegovina punched Turkey in the face with their physical style and won 73-66. I asked in the opening do we need to worry about Turkey. Well, let’s wait and see how they respond against Greece before we “worry”. The letdown is not totally a shock after Bosnia played with that same style at the warm-up tournament. Turkey also may have come into the game with a bit of a big head after blasting Czech Republic by 50 points in their first game. The players were having their pictures taken with the loads of fans after the game and the local team felt like unbeatable rock stars. Well, Bosnia and Herzegovina definitely showed them they cannot beat anybody just in passing. So, that’s why we should wait until the game against Greece to really start questioning them. Bosnia and Herzegovina were just one underdog to upset a big name on Day Two. The other two were the first two games of the day. The 2013 U18 European Championship Division B champions Montenegro knocked off Serbia while fellow promoted team Belgium knocked off Italy. Unfortunately these games took place at the same time as I was watching the Belgium vs Italy game. Sure, Montenegro beating Serbia is a surprise, but Zoran Nikolic collecting 20 points and 11 points for Montenegro was not at all, especially being held to seven points and 10 rebounds due to foul trouble in their opener against Spain. And Petar Popovic scoring 25 points is also not a surprise as he’s shown in the past that he can light it up. Still, it is a surprise that Serbia couldn’t find a way to win when they only committed four turnovers. But making just 4-of-22 (18 percent) from long range will do that. But where did that Belgium upset of Italy come? According to coach Steve Ibens, it’s from playing a “perfect” game. Okay, Thomas Akyazili was tremendous (21 points, eight rebounds and six assists) and Justin Kohajda did a great job controlling the glass (17 rebounds – six offensive). But we do have to give some of the blame of losing the game to Italy, who made just 14 of 26 free throws (54 percent). Montenegro beating Serbia actually gives a bit more credence to Spain’s level but the Iberians still have questions after beating Russia. Spain needed to come back late against Montenegro and then saw their 20-point third quarter lead dwindle down to three points at the end of the third quarter. Spain held on and prevailed but they also didn’t really put Russia away as neither team scored in the final two minutes of a seven-point Spain win. Spain to me are still underwhelming with two really good players in Marc Garcia and Yankuba Sima and a solid guy in Francisco Alonso. So, I will leave you today with the thought that as August 8 approaches quicker and quicker, I really cannot wait until the start of the 2014 FIBA U17 World Championship, which is going to be so much fun. 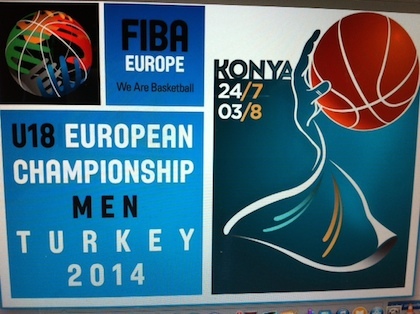 And we’ll see quite a few guys from this U18 European Championship in Dubai. Of course there are the Serbians Stefan Peno and Vanja Marinkovic and Greece have a quintet of 1997-born players here – Papagiannis, Vasileilos Charalamapopoulos, the aforementioned Mouratos, Dionysis Skoulidas and Antonios Koniaris. Jaume Sorolla will likely make the Spain team in Dubai as well while the France squad is made up solely of 1996-born players and Italy have 1997-born Cacu Nwohuocha, Leonardo Tote and Riccardo Cattapan on the U18 team. Well, the Day Three games will tip off in about 10 minutes. Hope you enjoyed this recap of the day. Just like I said about Day One, I hope I can give you another write up tomorrow about the action on Day Three. Enjoy the games – they’re on FIBA’s YouTube channel!